In Git, a tag is a label you can apply to a reference like a commit to mark it with information that might be important to other repository users. For example, you might tag the commit that was the beta release point for a project with the tag beta. For more information, see Use Git to Create a Tag. 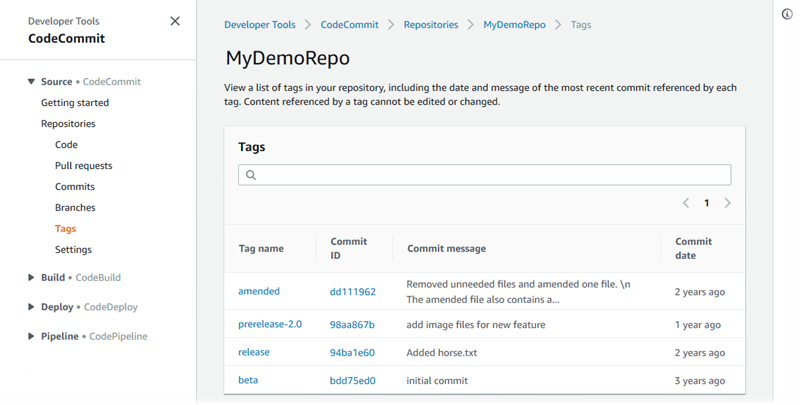 You can use the AWS CodeCommit console to view information about tags in your repository, including the date and commit message of the commit referenced by each tag. From the console, you can compare the commit referenced by the tag with the head of the default branch of your repository. Like any other commit, you can also view the code at the point of that tag. You can also use Git from your terminal or command line to view details about tags in a local repo. Use the AWS CodeCommit console to quickly view a list of tags for your repository and details about the commits referenced by the tags. In Repositories, choose the name of the repository where you want to view tags. In the navigation pane, choose Tags. You can adjust the number of tags displayed on the Tags page by changing the number of tags per page. To view the code as it was at that tagged commit, choose the tag name. To view details of the commit, including the full commit message, committer, and author, choose the abbreviated commit ID. git tag to view a list of tag names. git show to view information about a specific tag. git ls-remote to view information about tags in a CodeCommit repository. To ensure that your local repo is updated with all of the tags in the CodeCommit repository, run git fetch followed by git fetch --tags. In the following steps, we assume that you have already connected the local repo to a CodeCommit repository. For instructions, see Connect to a Repository. If no tags have been defined, git tag returns nothing. To exit the output of the tag information, type :q. Run the git ls-remote --tags command. If no tags have been defined, git ls-remote --tags returns a blank line.